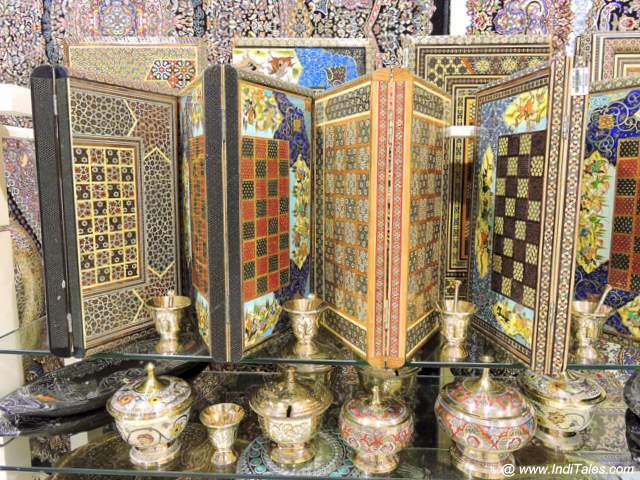 How do to get a piece of Sharjah with you – well pick up some of the Sharjah souvenirs. Bring them to the people back home or for your personal collection of travel memorabilia. This was my first visit to the UAE. I had some idea of the kind of souvenirs you get. However, day 1 we landed up in a Souq – as the marketplaces are called here, and I was floored to see so many souvenirs that you can buy in Sharjah. Here is my list of recommended Sharjah Souvenirs to buy. Let’s talk about the most obvious and probably the most loved souvenir from Sharjah – the dates. Go to any supermarket and you can see the Dates. However, head to Souq Al Jubail – the local market and you would go mad tasting the variety of dates available there. There are dates from a pale brown color to the darkest possible brown. There are small ones and there are huge ones. Nicely dried ones and semi-dried dates. Some are still sold along with their stems. The shopkeeper, most of who speak Hindi, would tell you the dates as per their origin – Irani Dates, Saudi Dates, local dates, etc. Rates can vary and bargaining hard is a norm. For those not content with dates, there is dates syrup to buy. We all know UAE and Sharjah are famous for their Gold Souq. These are shopping malls that sell only gold. I had always heard that your eyes start dazzling with gold after a while. It was in the Central Souq also called the Blue Souq that I experienced this. I walked with heavy gold jewelry displayed on both my sides. I tried to understand the different designs of gold jewelry in the Arab world. After talking to a few shopkeepers in Gold Souq here, I suggest picking up these two Arabian neck pieces called Martashiya & Marriya. Martashiya is a square arrangement of chains that is held back by a string thread. It would stand out on your neck. I initially thought it is something to cover the face with but I was wrong. Marriya is a long chain and in place of the pendant, you have this moon-like piece hanging in the middle. Let me warn you that both these are not only traditional Arabic designs but they both are quite heavy. So be prepared to lighten your wallet and lighten up your neck. Gold rates are slightly cheaper than India but the gold you get here is 21 karat, not the 22 karats we get in India. The Saffron is a native spice. It is used on all gourmet cuisine in this part of the world. Even the traditional Arabic coffee is not complete without the necessary flavor of saffron. Do you know Saffron is the costliest spice in the world? In the markets like Irani market or Al Jubail Souq, you can buy saffron for your regular use. I was surprised to see saffron in Attar shops. In fact, this is where we saw the raw strands of saffron. I was told this is to create saffron flavors. Saffron is a perfect Sharjah souvenir for the friends who appreciate fine flavors in their food. Carpets are not necessarily woven in UAE or Sharjah. However, it is a big market for carpets, so you can find carpets from around the world here. I spent some time talking to carpet sellers and figured out that Iranian carpets are the most wanted. The silk carpets are extremely expensive but a delight to look at. Now carpets are difficult to carry home as a regular tourist. Thankfully, I found some easy alternative to this. You get souvenirs like mouse pads, tea coasters or even ladies wallets made with the woven carpet material. I thought this is a great way to carry carpets as souvenirs without really carrying their weight and paying their price. So, when you visit, look out for their small carpet inspired souvenirs in the curio shops. Attar is a part of the culture of the Arab world. Attar is an oil based perfume. It still remains popular in the Islamic world as the modern perfumes are alcohol based that are forbidden in the religion. I would say you should buy the local flavors of Attar as souvenirs – they can be bought at as low a price as 5 AED or roughly 100 Rs. I love browsing through the colorful perfume bottles. As I was looking at a pile of Attar bottles in a shop, I realized they have local equivalents of each and every leading perfume brand in the world. I wonder what the owners of those brands would say but I guess for the locals it is their own version of the perfume. I would recommend buying authentic local flavors like Suleimani. I never knew that playing cards are so popular in Sharjah. Almost every souvenir shop has a set of playing cards with tourists locations on their backside. Quite a lot of these come in gold color – which I believe is the favorite color of the country. At one shop, the shopkeeper was selling the gold cards with a gold plated certificate. If you have card players in your family – this is a perfect souvenir. Do not be fooled by the gold color, negotiate hard. Some of my friends were able to get the cards at 40% of the price originally quoted. Chess was invented in India. It traveled eastwards and westwards through the silk route and like all immigrants it adapted to the adopted geographies. In Persia, it became Shatranj from Chatrang or Chaturanga meaning four parts. I found these nicely carved and engraved chess boards almost inviting me to a game of chess. While I am no chess player, but standing in front of those lovely boards – I wished I was. I think these lovely chess boards are a good souvenir to buy for the young ones around you. While you are not using them to play, they would make a great piece to display in your showcases. No market or souq is complete without an antique shop. I spent a lot of time in these shops. The older the stuff, the more it fascinates me. These antique shops not only invoked curiosity in me, but they were also very camera friendly. Both I and my camera loved them. There are a lot of ancient utensils you can see here – most of them come with exquisite engraving. There are metal boxes, there are pendants with nice calligraphy on them and there are tablets with Arabic verses. Stone pendants and raw stones are also on display. Musical instruments like Dholaks are all decorated with various things. This is the first time I saw such decorated musical instruments. The old coins can be picked up in most countries. However, here, I saw them displayed in abundance – sorted and placed in nice piles. You get not get a better souvenir for anyone who is into numismatics. Tea or coffee pots in metal come with a wooden handle. I am not sure how much you can use them once you bring them home, but they would sure look beautiful in your kitchen. In their miniature version, they would also make a perfect souvenir. Good luck charms can be found in every culture. Here are some unique ones. The iron that has served as horseshoe is considered a good luck charm. In many curio shops, you would see a battered horseshoe of iron. It is usually wrapped in plastic and writing on it prominently explains that this is a good luck charm. You can also see it on the main door of many shops. 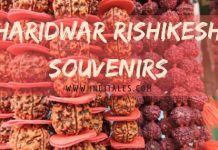 If you believe in good luck charms, do not think twice before picking up this souvenir. You will see Turkish evil eye charms everywhere in the markets. A peculiar version of it is something that I saw only here – an inverted hand in blue porcelain with an eye carved on the palm. The shopkeeper said it keeps the evil eye away from you. Can’t say anything about the promised protection, but I think it looks beautiful in a very charming blue color. If you collect good luck charms, this is a good one to add to your souvenir collection. In antique shops, I also found this inverted hand in metal. So, which of these do you like the most? Recommend you read following travel blog.